West Baltimore, Maryland, is a community that faces extreme disparities in health and poverty. 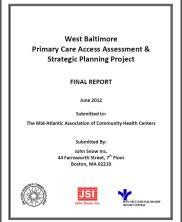 From June 2011 to June 2012, JSI conducted a comprehensive community health needs and access assessment in West Baltimore for the Mid-Atlantic Association of Community Health Centers (MACHC) and Bon Secours Hospital. The assessment activities included a rigorous review of existing quantitative, health-related data as well as a multi-pronged approach to capture qualitative data directly from West Baltimore residents and stakeholders through surveys and key informant interviews. In collaboration with a broad coalition of community stakeholders in West Baltimore JSI 1) clarified the area's major health concerns, 2) characterized the barriers that residents face in accessing appropriate primary care and other health-related services, 3) determined the extent to which there are gaps in the primary care safety net, and 4) explored ways that West Baltimore's major health and social service providers, and the community at-large, can work together to ensure access to appropriate primary care and improve the health and well-being of West Baltimore residents. The results of this work were presented to community stakeholders in the Spring of 2012 in order to develop a community strategic and collaborative effort to address the primary care access and health status in the community. This effort was funded by a grant from Kaiser Permanente of the Mid-Atlantic States.